After winding my way down many a tight country lane, I finally saw the signs to say that I had arrived at Camel Valley Vineyard. Ex-RAF pilot Bob Lindo and his wife Annie purchased the site in the early 1980’s and, by doing a vintage in Germany and reading everything he could about viticulture and vinification, set up from scratch what is now one of the top English vineyards in operation. At 7 hectares (24,000 vines) it is also the largest in Cornwall and is sited near to Bodmin, nestled in the undulations of the River Camel. 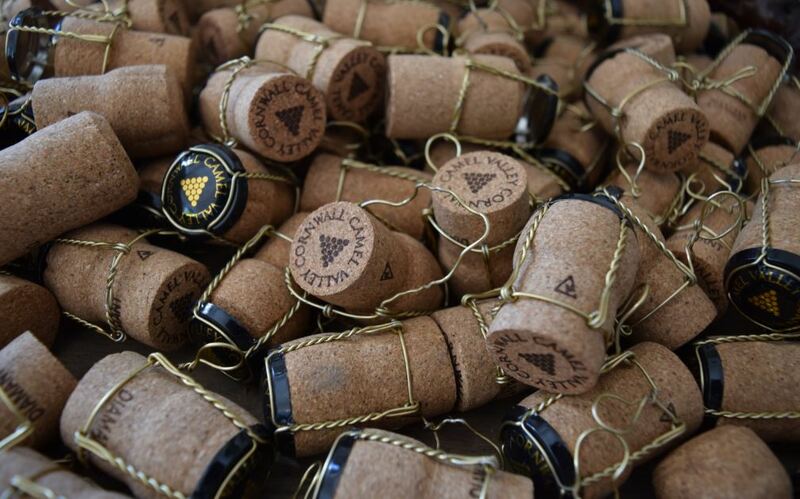 The first 8,000 vines were planted in 1989 and it wasn’t long before the awards started flowing. In 2007, Bob and Annie’s son Sam ignored the calling of a high flying career in the city and joined the team as winemaker. Sam brought different experiences to the table from those of Bob, having worked vintages in New Zealand, and the team have gone from strength to strength, culminating with the Queen choosing to serve their Pinot Noir 2008 Brut at a banquet in Buckingham Palace. To give you some idea of the size of the operation, they expect to make 220,000 bottles this year, but with the ever-changeable UK weather, poorer years such as 2012 only saw 50,000 bottles produced. In order to be fair to customers they try to keep the price of the wines constant even when they are in short supply, and thankfully (even with the big demand for their product) they have built up enough stocks from the good sized 2013 and 2014 vintages to ensure that they won’t be running out any time soon. 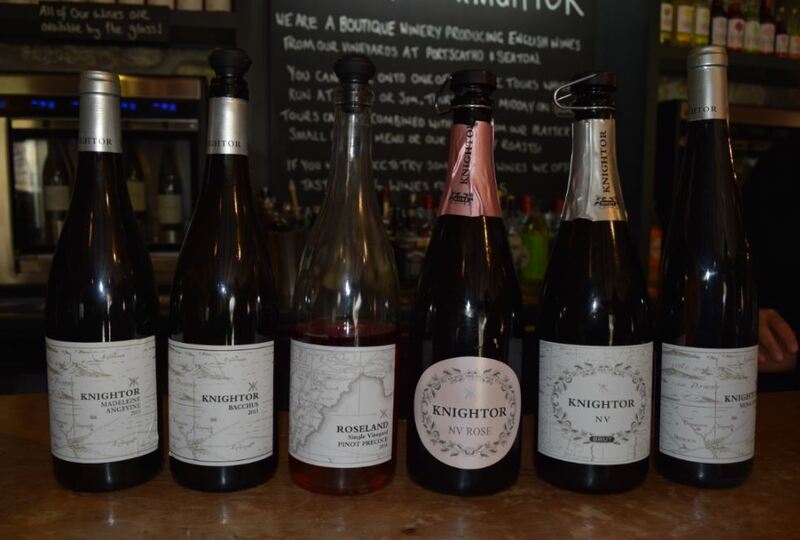 70% of the wines they produce are sparkling, with the remaining 30% made up of still red, white and rosé wines. Safety of the grapes here is paramount and we weren’t allowed to be let loose within the vines like at some vineyards, which was a shame. There was netting covering the canopies and timed shotgun noises to deter the birds, and low level electrified fencing to keep out invading badgers, so it would have been a tricky experience anyway. Thankfully they have well-appointed decking next to their retail shop where you can lazily enjoy a glass of wine whilst looking out over the sea of vines. The grapes themselves are on their last few days of hang time as we visit, soaking up the final rays of unseasonal warmth. The grapes are all hand-picked and on-standby is a team of 15 Bulgarians who return each year to complete the job. Inside the winery it is a glittering city of stainless steel tanks, and our tour guide happily showed us the plethora of new machinery recently purchased, including their de-stemmer and bottling line. There is a running joke within the winery that the bottling line (which is indeed impressive with mechanical grabbing, non-brine disgorging, corking, sealing and labelling) actually cost more to buy than the original purchase of all the vineyard land. An impressive notion! When having a good look around I did notice that, within the large stocks of bottles either ageing, being riddled, or in storage ready to go, there was nothing over and above the standard size. For one of the top English sparkling wines, and with certainly enough vines to be able to produce a larger format bottle, I wondered why they didn’t produce at least a magnum. I put the question to our guide, and she pointed out that the calibration on their bottling line is currently set for standard bottles only. This sounds to me like a good area to develop. English wines are in ascendency at the moment, looking for ways in to the crowded sparkling market, and if there is one thing they can do to drive forward the prestige it is to go for the majesty of the large format. I should add at this point that they do have a one-off Methuselah bottling of their Gold trophy winning 2012 Pinot Noir Rosé sparkling to purchase for £399, and so jump straight from the standard bottle to one that holds 8 bottles. That’s quite an impressive thing, as is the knowledge that it is the largest bottle of English sparkling wine available from any vineyard. The tour lasts approximately one and a half hours and costs £8.50 per adult. Included within the price is a full tour of the winery, access to the decking which overlooks the vines, and one glass of still wine. Unusually for a wine tour, you do only get to taste one wine, but it is a full glass as opposed to a tasting measure, so you have to ensure you pick one that you think you will like. You can also upgrade from still wine to sparkling by giving £1 extra as a charitable donation and, as it would be rude not to, I opted for the 2013 Annie’s Anniversary Brut (lovely creamy, fleshy green fruit, and searing acidity). As it is a working operation at this time of the year we did get to see Sam in action whilst we looked around, and owner Bob was an ever present sight running here and there, busy in some task or other. He was also happy to briefly chat which was nice, and it was good to see that he was still quite involved in things. I purchased both the 2009 Pinot Noir Brut (£29.95) and the 2013 Rosé Brut (£26.95), and will add my tasting notes here in due course to complete the document of my trip to Camel Valley.